Guzman Y Gomez Mexican Taqueria restaurants is a chain of Mexican fast food outlets found throughout Australia. Their standard cooking method over an open gas chargrill leads to high kitchen exhaust emissions. AOM Australia has equipped multiple GYG tenancies throughout Australia with commercial kitchen exhaust and filtration equipment. GYG particularly call on AOM when the kitchen exhaust discharge point is critical. This means that there is a significant risk of the exhaust causing a nuisance or that the exhaust point is non compliant to standards. GYG’s signature cooking style is over an open gas chargrill. This results in high kitchen exhaust emission concentrations. AOM are able to propose a range of solutions to GYG depending on the site specificities. For example, when there are spatial constraints, a high efficiency filtration AOM HC Series hood is proposed. In other cases, an in-duct filtration plant is installed. As with all AOM equipment supplies, AOM carries out after sales servicing of the equipment. This guarantees that the equipment is correctly serviced and maintained thus ensuring optimal performance and peace of mind. Broadbeach, Surfers Paradise: In-duct electrostatic filtration plant and odour mitigation. Post Office Square, Brisbane: High efficiency filtration exhaust hood with odour mitigation. Southbank, Brisbane: Replacement of a competitor’s electrostatic filtration plant which was unable to cope with the filtration load in this critical location. This led to continuous complaints against the tenancy. An AOM filtration plant was installed and is currently being manage thus removing all issues with the exhaust discharge of this tenancy. Toorak Rd, Melbourne: High efficiency filtration exhaust hood with odour mitigation. 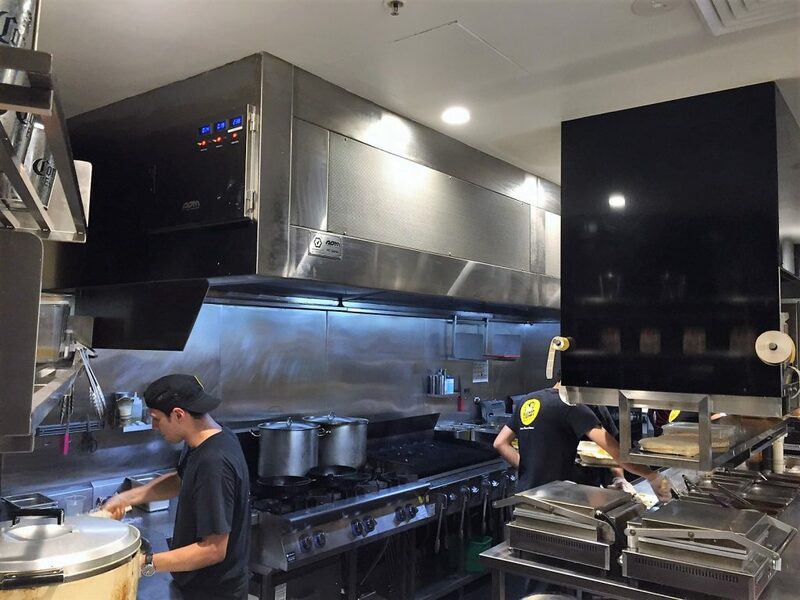 Hawthorn, Melbourne: High efficiency filtration exhaust hood with odour mitigation. Punt Rd, Melbourne: In-duct electrostatic filtration plant and odour mitigation. Darling Park, Sydney: High efficiency filtration exhaust hood with odour mitigation. King William St, Adelaide: High efficiency filtration exhaust hood with odour mitigation for critical discharge in center of CBD Adelaide. Today, AOM Australia continues to work with GYG to develop better equipment selections and after sales services.